Luxurious 2 and 3 bedroom cottages on approximately 75 acres in the Belair Forest in the East Beaches area of Lake Winnipeg. Located minutes from the white sands of Grand Beach, Hillside Beach, Albert Beach, Victoria Beach and Lester Beach in beautiful Belair, Manitoba - just a one-hour drive north of Winnipeg. 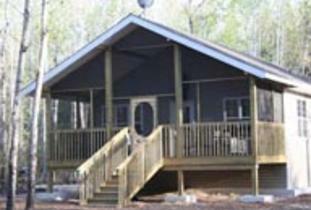 Bear Country Cottages boasts six newer constructed luxurious cabins designed to pamper couples, accommodate a family of eight or smaller groups. Each luxury cottage comes fully equipped with two or three bedrooms, an extra large Jacuzzi Spa (two bedroom cottages only - outdoor hot tubs on the decks of the two bedroom cottages are optional) or a 6 person hot tub (included with the three bedroom cottages), steam showers (3 bedroom cottages only), home theatre system w/ surround sound, DVD player, Nintendo game systems for kids and a full gourmet kitchen complete with appliances, cookware, dishes and towels; everything you'll need for your hearty cottage appetite. All cottages are air conditioned! Come to relax and unwind in the peace and tranquility of Bear Country Cottages - just one hour north of Winnipeg, Manitoba Canada. Reconnect with nature outside by your private fire pit, or lounge on the screened in deck and take in the soothing sounds of the forest. Don't forget to look up at night to see the stars! Spectacular! Revel in the vast array of magnificent wildlife and recharge on the white sandy beaches just a few short minutes from "Bear Country". Take a short jaunt to the Lester Beach lookout and witness the most breathtaking sunsets you'll ever see! You won't be disappointed. This is truly the place where memories are made! !